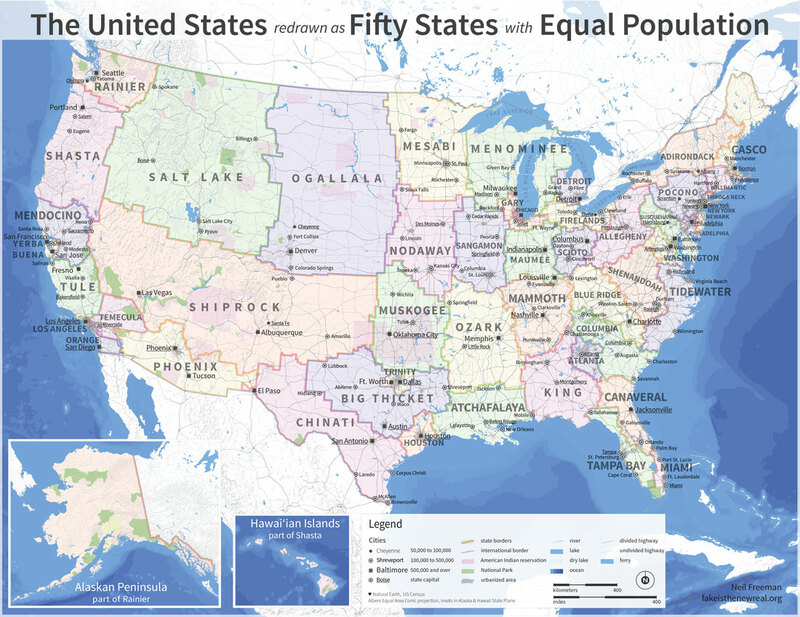 Neil Freeman posted an interesting question on his blog, Fake is the New Real: What would the United States look like if each state were equal in population? Freeman, an artist and urban planner, has redrawn the map of the United States to show what it would look like if the same number of people occupied each state. Freeman’s “United States redrawn as Fifty States with Equal Population” takes a radically simple stab at Electoral College reform, preserving its structure and function while simultaneously ending the overrepresentation of small states and underrepresentation of large states in presidential voting by eliminating small and large states altogether. Using data from the 2010 U.S. Census, Freeman says his map’s redrawn boundaries “more closely follow economic patterns, since many states are more centered on one or two metro areas.” It also would end varying representation by population in the U.S. House. Each state in Freeman’s redrawn America has a population of roughly 6,175,000. Many state capitals were maintained in Freeman’s configuration; otherwise, large or central cities were chosen. Suggested names of the new states, he adds, were taken mainly from geographical features, including mountain ranges (Adirondack, Blue Ridge, Ozark), peaks (Mammoth), rivers (Susquehanna), lakes (Salt Lake), plants (Yerba Buena) and even caves (Shiprock). The map began with an algorithm that grouped counties based on proximity, urban area, and commuting patterns. The algorithm was seeded with the fifty largest cities. After that, manual changes took into account compact shapes, equal populations, metro areas divided by state lines, and drainage basins. In certain areas, divisions are based on census tract lines. The District of Columbia is included into the state of Washington, with the Mall, major monuments and Federal buildings set off as the seat of the federal government. Preserves the historic structure and function of the Electoral College. Ends the over-representation of small states and under-representation of large states in presidential voting and in the US Senate by eliminating small and large states. Political boundaries more closely follow economic patterns, since many states are more centered on one or two metro areas. States could be redistricted after each census – just like House seats are distributed now. Some county names are duplicated in new states. Some local governments would experience a shift in state laws and procedures.